The new novel in the ever-popular mystery series finds the Puzzle Lady on the set of a movie about her own life―and when the first dead body shows up on set, it comes with a crossword puzzle. It’s murder on the movie set! 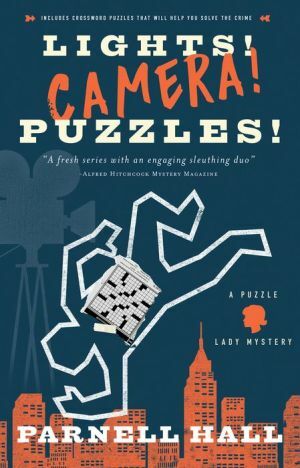 It’s no surprise when Cora Felton’s ex-husband’s sensational tell-all memoir, Confessions of a Trophy Husband: My Life with the Puzzle Lady, is optioned for the movies, but it certainly raises eyebrows when the Puzzle Lady herself signed on as an associate producer. Cora explains gamely that she hoped to have some control over the project. The truth is that she needs the money. Now Cora is filming her life story on location in New York City, and things couldn’t be worse. She doesn’t like the script, she doesn’t like the director, and she absolutely hates the actress who is playing her in the movie. It’s almost a relief when the first dead body shows up on the set. If only it didn’t come with a crossword puzzle . . .